Christians often talk about claiming our cities for Christ and the need to address urban concerns. But according to Eric Jacobsen, this discussion has remained far too abstract. 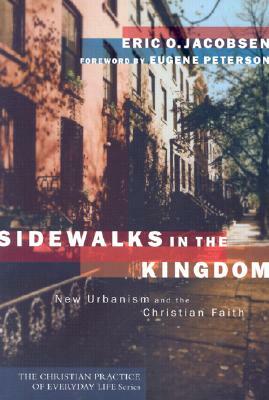 Sidewalks in the Kingdom challenges Christians to gain an informed vision for the physical layout and structure of the city. Jacobsen emphasizes the need to preserve the nourishing characteristics of traditional city life, including shared public spaces, thriving neighborhoods, and a well-supported local economy. He explains how urban settings create unexpected and natural opportunities to initiate friendship and share faith in Christ. Helpful features include a glossary, a bibliography, and a description of New Urbanism. Pastors, city-dwellers, and those interested in urban ministry and development will be encouraged by Sidewalks in the Kingdom. Eric O. Jacobsen is adjunct professor of theology and culture at Fuller Theological Seminary. He previously served as associate pastor of First Presbyterian Church in Missoula, Montana. Jacobsen is a member of the Congress for the New Urbanism.